There is a lack of physical activity in the day-to-day activities in suburban life due to the sprawling layout and design. From this, I felt that the overall suburban experience could be condensed into the experience of three chairs; the front seat of a car, an office chair and a la-Z-boy recliner. 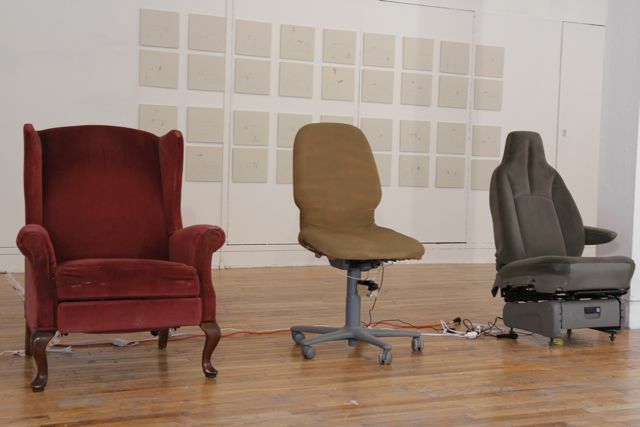 I wanted to emphasize how frequently these chairs are used by activating them with a series of motors and mechanical systems, creating the appearance as though they were actually being used. So, the office chair would swivel back and forth, the front seat of the car would vibrate to suggest that a car engine was turned on and the la-Z-boy’s foot rest would automatically swing in and out. By the end of the semester I was able to get the office chair and the car seat to work as I intended, but am still working on automating the motions of the recliner. I believe my problem is a lack of efficiency in the system I devised that attaches to the motor which is mounted under the chair. Over the summer I plan to revise this and get the last chair up and running. **Documentation taken from the display of the exhibition Unsettling Space: A Study of the American Suburbs, which the piece A Summary of Suburban Life was a part of.